Asian diets are as varied as the Asian continent is large. Although each Asian country and region has its distinct ﬂavors and cooking styles, there are many unifying characteristics, such as high consumption of plant foods, including vegetables, fruits, beans, legumes, nuts, herbs and spices. What is the Asian Diet? Oldways introduced the Asian Diet Pyramid in 1995 at the International Conference on the Diets of Asia in San Francisco, developed in conjunction with the Cornell-China-Oxford Project on Nutrition, Health and Environment, and the Harvard School of Public Health. The traditional diet in many Asian countries is often closely tied to both religious practices and long-standing customs, and the record of these eating habits is an excellent source of information and culinary inspiration: Vegetables and more vegetables, strong spices, rice and noodles, seafood, and soy products. Foods to enjoy every day: leafy greens, legumes, vegetables, soy foods, whole grains, herbs and spices. Fish or shellﬁsh servings twice each week. Moderate portions of eggs, poultry, and healthy cooking oils. Infrequent servings of red meats and sweets. 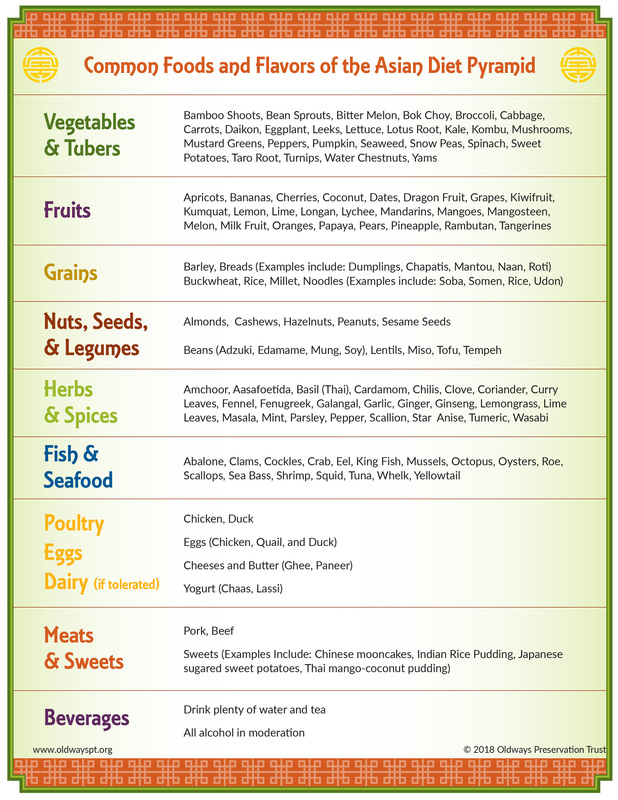 Oldways oﬀers resoures for starting the Asian Diet, including infographics and charts, recipes, and nutrition facts. Read below to get started with this healthy and delicious way of eating! 1. Eat mindfully. In traditional Asian cultures, people enjoy their food with gratitude, rather than multitasking, stuﬃng themselves, or counting calories. Make mealtime a happy time by being present, savoring the ﬂavors, and honoring your body’s natural hunger and fullness cues. 2. Make vegetables the star, not the supporting actor. Though sauces and seasonings vary, Asian diets all have one thing in common—lots of vegetables at each meal. 3. Use meat as a garnish. Because meat was traditionally very expensive, it is consumed in very small portions per meal—just enough to provide a boost of protein and ﬂavor. Fish and seafood are more commonly eaten than meat in many coastal communities. 4. Enjoy soy. Throughout Asia, soy foods (such as tofu, edamame, or tempeh) are enjoyed by all eaters, not just vegetarians. Try replacing one meat-based meal with one soy-based meal each week, then work your way up. 5. Fill up with hot soups. Sometimes, our bodies confuse thirst for hunger. Rather than ﬁlling up on heavy appetizers at lunch or dinner, start your meals with a warm cup of broth-based soup. In most Asian countries, this practice is believed to improve digestion and control the appetite. 6. Drink tea and water. Science has shown many health beneﬁts of tea, especially green tea, such as lower risk of obesity and chronic disease. For the biggest nutrition boost, pass on any added cream or sugar. 7. Share meals with others. Every meal is an opportunity to bond with friends and family and enjoy the pleasures of the table. 8. Be physically active. A healthy lifestyle is about more than just food. Try some traditional Asian exercises, such as Tai Chi or yoga. Learn more about the health beneﬁts and the “how-to” of the traditional Asian Diet, with our Welcome to the Asian Diet brochure. This trifold brochure, available either as a downloadable PDF or in hard copy, includes the 8 simple steps above, plus more – to introduce you to the Asian Diet. To purchase hard copies of this brochure, please visit our Oldways store. Whether you choose familiar vegetables, fruits, grains and other foods and ﬂavor them with Asian spices, or experiment with less familiar ingredients from an Asian market, you’ll ﬁnd plenty of delicious choices. Click on the list of traditional Asian foods below to download a copy. To learn more about traditional Asian ingredients that you may not be familiar with, check out our Asian Foods Glossary. Residents of Okinawa, oﬀ the coast of Japan, have traditionally been one of the longest-lived populations on earth. Incidence of heart disease, cancer, and obesity are much rarer in most Asian societies than in Western countries. (Cardiovascular death rates in Japan, for instance, are less than half those in the U.S.) What is it about the Asian diet that accounts for these health advantages? Oldways’ Asian Diet Pyramid helps to explain. Asian countries hold nearly half the world’s population, and their traditional foods vary in many respects. With a geographical base including countries as diverse as Bangladesh, Cambodia, China, India, Indonesian, Japan, Laos, Malaysia, Mongolia, Myanmar, Nepal, North Korea, South Korea, Philippines, Singapore, Taiwan, Thailand, and Vietnam, the traditional Asian Diet covers a lot of territory, in both a geographical and a culinary sense. Yet Asian diets also hold much in common. Vegetarian traditions are strong in most Asian countries, with pulses and whole grains such as millet and barley, all enlivened with soy sauce, fermented ﬁsh sauce, or various spicy condiments. Almost all Asian countries share one food in common: rice, which is prepared and eaten somewhat diﬀerently from country to country. But as the staple food central to survival, especially during times of famine, rice has acquired an almost sacred status in Asian societies, and it is served in many ways. It is a signiﬁcant part of each meal of the day; incorporated as a main ingredient in confections such as candy and cakes; fermented to make wine (a tradition in most countries) or beer; and traditionally oﬀered to the gods to ensure a good harvest. Fish is commonly eaten, and meat is fairly rare, usually enjoyed in small amounts as a ﬂavoring in dishes—not as a huge steak in the center of the plate! Spices, herbs, fermented vegetables, sprouts, and healthy fats are also widely consumed, making for a ﬂavorful and imaginative diet. When Asians and those of Asian ancestry give up these traditional foods for a more Western diet, however, their health can plummet. Diabetes rates in China today rival those in the United States, and obesity and overweight are soaring as fast food and sedentary lifestyles replace a life of manual labor fed by rice and vegetables. Check out our Health Studies page to learn more about the links between Asian diets and lifestyle and health. We’re very grateful to all of our advisors for their help in creating the Asian Diet Pyramid. Learn more about them here! These featured resources will help you start incorporating the Asian Diet into your day-to-day life. Or browse all Asian Diet Resources. We have hundreds of delicious and nutritious recipes. Not sure where to start? Try our ingredients search. Get health information, news and recipes via our program newsletters.